The Force Awakens fan art is everywhere. 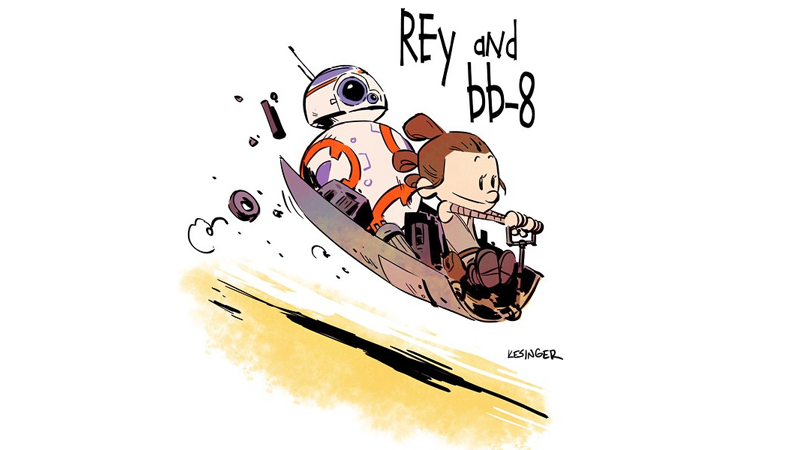 But none can top Brian Kesinger’s mashup of the film’s characters with the wonderful stylings of Bill Watterson. None of it. Over the past few days Kesinger, a storyboard artist for Disney, has been posting snaps of his artwork to Instagram. The pairings are perfect: Rey and BB-8, Poe and Finn, Kylo Ren and his favorite, Sith Lord Darth Vader. Kesinger has posted one final piece to Instagram—but it’s got spoilers for The Force Awakens. If you’ve seen the movie (or don’t mind knowing what happens) we highly recommend heading over to his page to see it. Kesinger said he won’t be selling prints of the art, because he doesn’t own the characters—but you can check out some of his other work on Etsy (two words: Steampunk Octopus).